The Sailing Passenger Vessel Star Flyer of Star Clipper Cruise Lines is a modern clipper ship which combines a true sailing experience with elegant accommodations and fine dining. The beautiful sleek lines of the Flyer along with her 16 hand raised sails comprising over 36,000sq. ft. draw attention everywhere she sails. The intimate size- 360 ft. will allow us to visit some of the smaller, out-of-the-way anchorages normally accessible only to cruising yachts. A full complimentary water sports program onboard provides kayaks, paddle boards, sailboats, and Zodiac trips. All staterooms are thoughtfully designed and feature private bathrooms, air conditioning, hair dryers, private safe, television, DVD player, and telephone. Most staterooms in Categories 2-4 may be configured with either one double bed or two single beds. Some Category 2-5 Staterooms may accommodate a third person. All staterooms include a porthole(s) excluding two Category 5 and all Category 6 staterooms which are inside. Category 1 staterooms open onto the deck and include a larger window facing the deck. The Star Flyer's electrical output is 220 volts with North American style outlets. Owners Suite (OS): Clipper Deck- luxurious large outside stateroom with one queen double bed, separate sitting area, minibar (additional), one full marble bathroom with whirlpool. Category 1: Main Deck and Sun Deck- deluxe outside deck stateroom, larger window facing deck, one queen double bed, minibar (additional), marble bathroom with whirlpool, cabin door opens onto deck. Category 2: Clipper Deck- larger outside stateroom, one queen or two single beds, some with optional fold-down single bed for third person, marble bathroom with shower. Category 3: Clipper Deck and Commodore Deck- outside stateroom, one queen or two single beds, some with optional fold-down single bed for third person, marble bathroom with shower. Category 4: Commodore Deck- outside cabin, one queen or two single beds, some with optional fold-down single bed for third person, marble bathroom with shower. Category 5: Clipper Deck and Commodore Deck- inside and outside staterooms with marble bathroom with shower. Six Category 5 staterooms on the outside are of slightly different shape as they may configure to the shape of the ship and include raised double beds which must be accessed by a small step ladder. Two Category 5 staterooms are located inside and have the option of one queen or two single beds with an optional fold-down single bed for third person. These interior staterooms do not have a porthole. 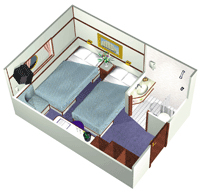 Category 6: Commodore Deck- inside cabin, two single beds (upper and lower), bathroom with shower. All dining is open seating- dine whenever and with whomever you wish. An international menu of foods from the far corners of the earth. When you rise, help yourself to a continental breakfast with croissants, toasted English muffins or sweet Danish pastries. Or savor a full breakfast with fresh tropical fruits and crisp bacon, grilled sausage, smoked salmon and omelets cooked to order in the dining room. At lunch, a marvelous buffet of seafood, salads and grilled favorites awaits your pleasure. When evening comes, the elegantly appointed dining room, featuring a splendid collection of paintings of sailing ships, becomes the setting for the chef’s finest culinary presentations, designed to please the eye and the palate. And complemented by equally fine wines. You’ll find service to be friendly and gracious, befitting a tasteful restaurant. Massage: Enjoy a traditional Thai massage (additional charges apply). Watersports: The Star Flyer is outfitted with a comprehensive onboard watersports program including complimentary snorkeling gear, Sunfish sailboats, ocean kayaks, and stand-up paddle boards. Recommended Dress: No jackets required! Overall the recommended cruise attire is casual. Beach attire on-deck during the days. Indoor dining areas during the day require shorts, wraps, shirts, footwear, and no bathing suits. Evenings in the dining room are best for dress shorts, pants (slacks or jeans), dress t-shirts and collared casual shirts/polos (no tank tops) for men. Skirts, sundresses, dress shorts, slacks, jeans, etc. for women. A light long-sleeved shirt is recommended for the evenings as the trade winds can get a little cool on recently sunbathed skin. Weather: on average one can expect daily high temperatures in the mid 80‘s and low temperatures in the mid 70‘s this time of year. Sea water temperatures average around 79°F. Typical trade winds blow a steady 10-15 mph. Persons with Physical Challenges and Disabilities- The Star Flyer is a true sailing ship and passengers must be physically capable of negotiating stairways inside the ship as well as while boarding and disembarking the ship via the gangway alongside a dock and at anchor. There are no elevators aboard. The ship will also be at anchor almost exclusively throughout the week which requires passengers to use the steep gangway and board tenders which will transport guests to small docks or beach landings. As the ship is a foreign flagged vessel and the cruise line is based in Europe, there are not the accommodations for disabled persons aboard as you may find in the US. Please contact Local Knowledge for more detailed information.